UT-165_rescue_v1.0.3.1 format tool can repair and format corrupted USbest flash drives with Chip part number UT165 .Download rescue v1.0.3.1 utility software and fix your corrupted flash disk . 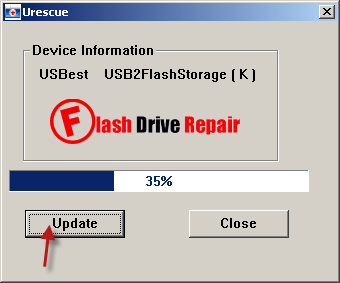 UT-165_rescue_v1.0.3.1 formatter has been designed to repair and format corrupted USbest flash drives . 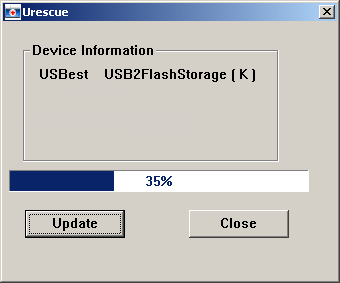 UT165 rescue v1.0.3.1 can update USbest flash disk controller firmware with chip part number UT165 . USbest UT165 formatter allows you to fix USbest flash drives format errors such as windows unable to format disk error message ,Please insert Disk error message ,Raw flash disks ,Write protection flash drives problem and other format problems . UT-165_rescue_v1.0.3.1 recovery tool support repairing USbest UT165 chip controller so please be careful and don't use it with different controller ,You must determine your flash drive chip vendor first .You can use Chip genius software or USBDeview V2.30 utility . How to update USbest UT-165 controller firmware ? Download UT-165_rescue_v1.0.3.1.rar from download links below . Insert corrupted USbest UT165 USB flash disk to your computer . Extract UT-165_rescue_v1.0.3.1.rar and open UT-165_rescue_v1.0.3.1.exe . If your flash drive supported ,you will see flash information details appears on the program interface , if not you will got this message " Device not found , please insert device " . To begin formatting your flash disk , click Update . Wait until finish updating UT165 firmware and don't interrupt formatting process . Note that all data inside flash disk will be fully erased .